Eden Hall, will feature 90 three one- and two-story, attached home designs, ranging in size from 1,700 to more than 3,000 square feet, with downstairs owner’s retreats. Eden Hall homeowners will have access to an extensive internal trail system around the existing lake, all connected to the Matthews Trail walking system and downtown Matthews – add something about being inside I-485 loop. 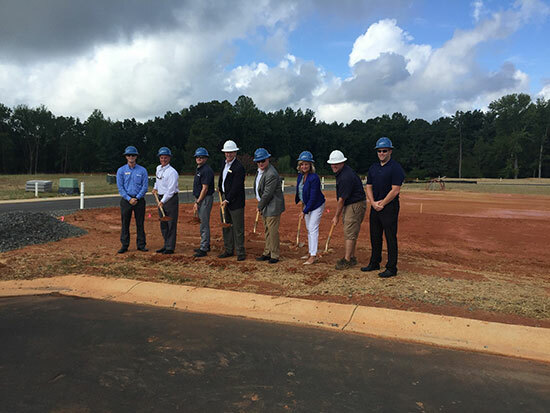 Team members from David Weekley Homes and LandDesign helped Matthews Mayor Jim Taylor break ground on Weekley’s newest community, Encore at Eden Hall. Weekley Homes anticipates opening its fully-furnished model home, along with sales, in Early 2017. For more information about David Weekley Homes in Encore at Eden Hall, contact 800-393-9968. David Weekley Homes, the nation’s largest privately-held home builder, is celebrating its 40th anniversary in 2016. Headquartered in Houston, the company operates in 24 cities and 13 states across the United States. David Weekley Homes was the first builder in the United States to be awarded the Triple Crown of American Home Building, an honor which includes “America’s Best Builder,” “National Housing Quality Award” and “National Builder of the Year.” David Weekley Homes has also appeared nine times on FORTUNE magazine’s “100 Best Companies to Work For®” list. Since 1976, the company has closed more than 80,000 homes. For more information, visit www.davidweekleyhomes.com.